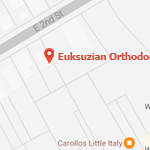 At Euksuzian Orthodontics, we take pride in helping our patients achieve healthy, beautiful, long-lasting smiles. Dr. Sarkis Euksuzian and our expert team work with every patient on an individual level, designing personalized treatment plans that perfectly suit each patient’s unique orthodontic needs and lifestyle. We know every patient is different, which is why we’re proud to offer a wide variety of treatment options at our office – and one of the most popular is Invisalign. Virtually Invisible: Invisalign is almost invisible when worn, so there’s no need to worry about having braces for photos, presentations at work, or any other major events. Enjoy Your Favorite Foods: Because you remove the aligners to eat, you’ll have none of the dietary restrictions that come with traditional braces. Oral Hygiene is Easy: You take the aligners out to brush and floss, so oral hygiene is as easy as ever – no need to worry about floss threaders or other devices. Improved Comfort: Invisalign aligners are smooth to the touch and lay flat against teeth, so you won’t experience the cuts and scrapes that come with normal braces. It all starts with your initial appointment. 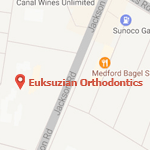 Here, you’ll receive a comprehensive orthodontic evaluation from Dr. Sarkis Euksuzian. If your diagnosis warrants Invisalign treatment, Dr. Sarkis Euksuzian will then formulate a detailed treatment plan. We’ll send the data from the treatment plan to the Invisalign company, who will custom manufacture your own set of aligners for you. 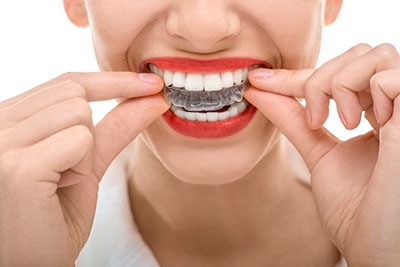 You’ll wear each set of aligners 22 hours a day before switching to the next set, and with each new pair, your teeth will move closer to their final positions. Once you finish your last aligner, you’ll have a beautiful, healthy new smile that’s yours to keep forever! Whether you’re an adult looking to invest in your best asset or a teenager starting down the path towards a lifetime of beautiful smiles, Invisalign is a convenient, effective way to straighten teeth. If you have more questions or want to find out if Invisalign is right for you, we encourage you to give us a call at (609) 654-0600 for our Medford office, (856) 234-2992 for our Moorestown office, or reach out to us at our contact page with any questions or to schedule an appointment at either of our offices. We can’t wait to hear from you, and we look forward to helping you achieve a beautiful, healthy new smile!